We present: the standsome. A put-up hinge, a height-adjustable desk, a standing desk, a rack. It is difficult to describe the standsome, but its usage is all the easier. You’ll just love it. The standsome consists of four wooden plates that are easily put together without any screw, spit or kit. It takes 50 seconds, at the most, for lefties and shaky ones. Everyone else will put it together in under 40 s.
The standsome is made of wood. It has a plane and simple form, solid and long-lasting material and a natural and intuitive handling. You probably can’t wash it, but one surely can wipe it clean – it is lacquered. German professionals lasered, milled, rasped and grinded it. The standsome is full of lifeblood, sweat and diligence. Nevertheless, it is free from any meat, mortar, plastic. Happy wooden harmony. Zen. Ultra-Zen. The Zensten. And the most punk. 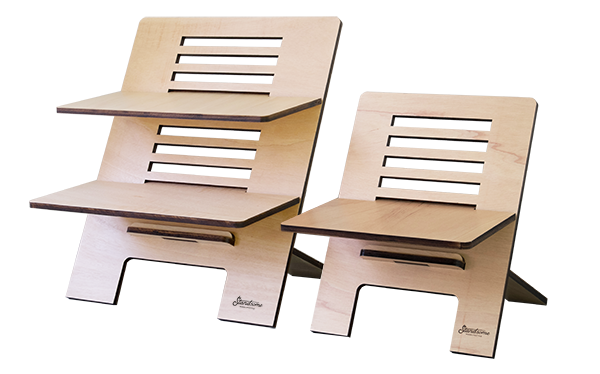 ‘Cause the standsome revolutionizes desk work. It fits any desk, any console, any place. It is light, solid – delicious. A crown jewel cut into plywood. Finest editing, plate platinum, golden furniture. For seat giants and short legged. The standsome is available in different sizes and designs. There is more information about content, dimensions and details for private customers in our shop. With our standsome-line we bridge the gab between high-priced and complex high desks and unergonomic and often unsolid smaller products. Easy to handle and robust, the standsome high-desk positioner converts any desk into a standing desk in a twinkling of an eye and improves health and productivity. The standsome is produced in Germany – from its conception on until its finishing. The wages, taxes, fees and logistic are payed in Germany. Yet, we can offer the standsome at a fair and affordable price. 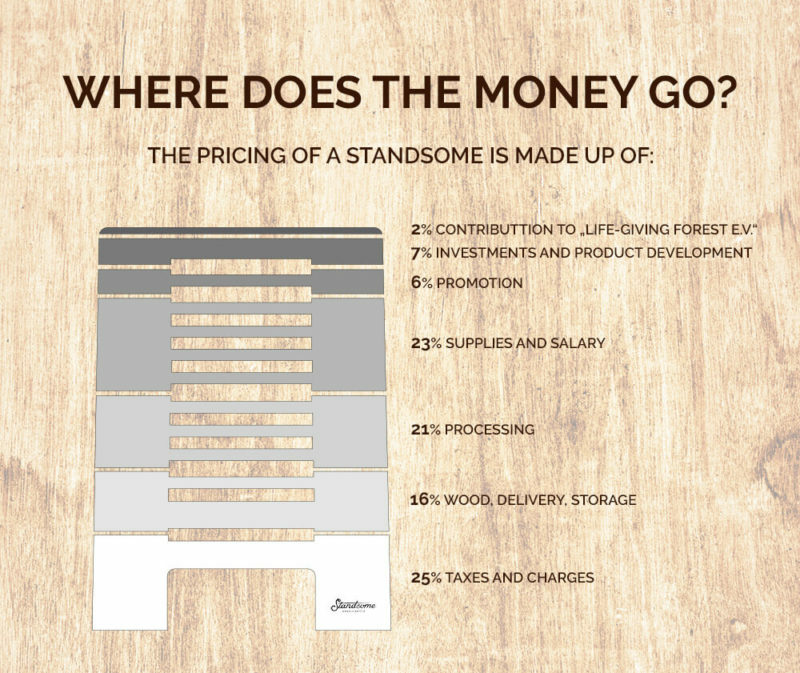 At a glance: Here, you’ll find 8 reasons for the standsome.